For those looking for the benefits and magic of staying at a Walt Disney World Resort but at an affordable price, All-Star Music may have you singing a tune! Opened after All-Star Sports, this sprawling 1900+ room resort offers an array of amenities and Disney magic to each of it's guests. Tip: We have over 250 detailed photos of the All-Star Music Resort in our PassPorter Photo Archive! Check them out! Located in the Animal Kingdom Resort area of Walt Disney World property, the resort is themed to bring guests in sync with different genres of music. Each section within the resort has a musical theme, complete with accentuating décor in guest rooms and huge icons near the buildings and in the courtyards. If you are a country music fan, you might find yourself at home in the Country Fair section. Jazz Inn, Rock Inn, and Calypsooffer theming specific to these types of sounds and theater buffs might find themselves in heaven in the Broadway Hotel section. Guest rooms at All-Star Music are classified as either standard or preferred. Standard rooms are located throughout the property, while preferred rooms are located in the Calypso section. While preferred rooms do cost a bit more, for your extra dollars put you into buildings conveniently located near Melody Hall, the central hub of activity for the resort. Accommodations in standard or preferred rooms include two double beds, a small table and chairs, as well as a small-but-handy TV armoire with three drawers and several shelves. The rooms accommodate four people and a child under age 3 in a crib. As with all Disney's Value resorts, these are the smallest rooms of any of the Disney resorts at 260 sq. feet. Summer 2006 brought some exciting changes to All-Star Music: Family Suites that accommodate up to six persons plus one child were added to parts of the Jazz and Calypso sections. The suites are available in both standard and preferred locations. Twice the area of a standard room, these suites feature a separate bedroom with queen bed, plus a sofa sleeper and two convertible twin beds in the living area and a kitchenette. One of the biggest advantages is not one but two full bathrooms, a real plus for large families! While there is no full service restaurant on site at All-Star Music, Intermission Food Court offers several food stations with a variety of offerings for breakfast, lunch, dinner, and late evening snacking. You can pick up a refillable mug here for $11.99 and refill it as many times as you wish during your stay. A small bar -- Singing Spirits -- is accessible from inside the food court as well as outside near the pool. In addition, there is a pizza delivery service should you feel like taking a break and eating in your room. 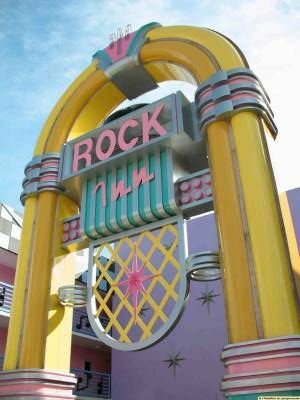 Recreation offered here includes two pools -- Calypso (Guitar) and Piano -- shaped like these two instruments for an extra dose of whimsy, as well as a playground, game room (arcade), and shopping at Maestro Mickey's in Melody Hall. Need help with tickets or dining arrangements? No problem! Visit Melody Hall for guest services and check-in. Also at Melody Hall is the origination point for Walt Disney World transportation from the resort. Bus service departs for all the Disney parks and Downtown Disney. Some bus routes make several stops. If you are wishing to journey to another resort, you'll need to make transfers, which can take up to an hour so do plan accordingly. Be sure to take advantage of the many photo opportunities that abound at this unique resort! Grab a drink and stroll among the many sections then strike a pose near the giant cowboy boots or jukebox. The All-Star Resorts are popular with families as well as large groups so some areas, especially ones in which there is more activity, may be noisier than others. Those looking for quieter spots might do well to request rooms in Country Fair. Rooms facing away from pools also provide a little more solace. 2008 rates for All-Star Music rooms begin at $82. The Family Suites start at $184 -- these rates do not include 13% sales and lodging tax. Always ask your travel agent or Disney Reservations about any possible specials or discounts that might be available to you during your stay such as AAA, CAA, Annual Passholder or Florida Resident. This article originally appeared in our December 21, 2006 newsletter and was last checked for accuracy on February 19, 2008 by Marnie Urmaza -- subscribe to our popular newsletter today for free!